Two Boneheads Video Series: Tennis Elbow - Jeffrey H. Berg, M.D. Tennis elbow is a very common source of elbow pain. Medically, it is referred to as lateral epicondylitis. 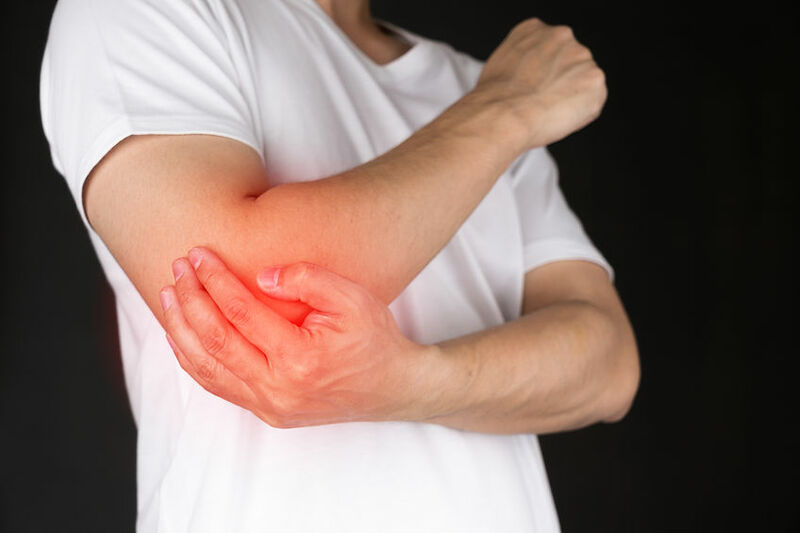 This term refers to an inflammatory source, but actually tennis elbow is a degenerative process that results from overuse of the tendons responsible for extending your wrist and fingers. There often is associated inflammation and this can be a contributing cause of your pain…but it’s not the root of the problem. Tennis elbow most often afflicts people between ages 40-60. The diagnosis is primarily made based on the history you provide and your clinical exam. Although x-rays may be used to rule out other sources of the problem, more advanced studies such as MRIs are usually not needed. In fact, they often can be misleading. Typically the symptoms consist primarily of pain on the outside of your elbow. The pain is most often noted while gripping or lifting. On occasion, there is pain with simple elbow motion and even, in more advanced cases, when the elbow is at rest. Sometimes painful stiffness exists as well. If present, this stiffness is usually noted after a period of rest or in the morning after sleeping. Fortunately tennis elbow usually resolves with time,.. if you can wait long enough. Only rarely is surgery needed. The treatment of this overuse, degenerative process is therefore aimed at protecting the elbow against further damage, reducing your pain in an effort to “buy” time for healing and rehabilitation in order to prevent recurrences. At this time, there is no reliable method to actually hasten healing of the damaged tendon. In the following short video, watch The Two Boneheads (Dr. Howard Luks and me) as we discuss this common, painful elbow problem. We hope that you find this information helpful. As always, if you have any questions or comments, please ask us here or contact us in our clinics.